But it can't be from Dolly Clackett. She gave me an Easter egg! : Boos? Really, how gauche. Hello my little chickens, how is everyone? I'm sitting here, drinking gin, with half an eye on the first episode of that terrible mini-series The Kennedys. You know, with Katie Holmes as Jackie Kennedy? Nic bought me the DVDs as part of my birthday present. I wouldn't usually go in for watching something just because it is bad, but this is an honourable exception. You guys, it is so bad. I love it. Katie Holmes is pretty terrible (which is a shame, because I think she's not totally untalented) but she's trying her little heart out, you know? And I have just heard that they're making a follow-up called After Camelot, which, YES. 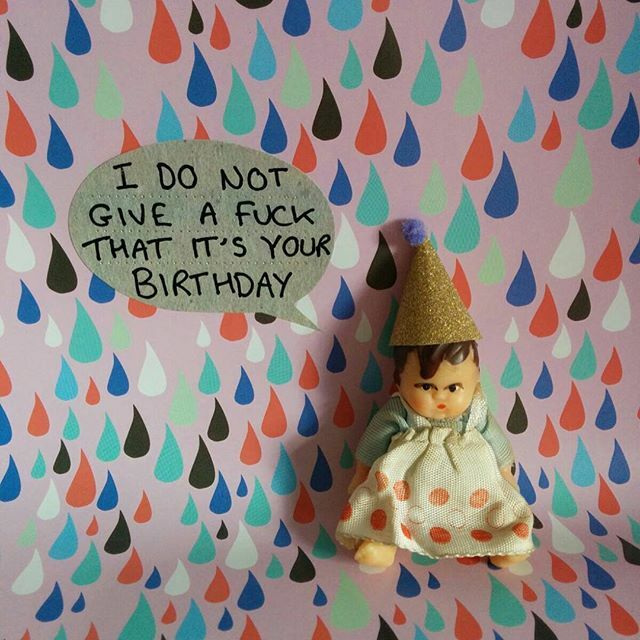 Thanks, Angry Baby! I did some sewing on Thursday afternoon and some on Saturday, and I cut out a dress today to try to sew in the next few days. It feels good to have the time and the mental energy to want to sew, you know? This post tonight isn't about sewing though. 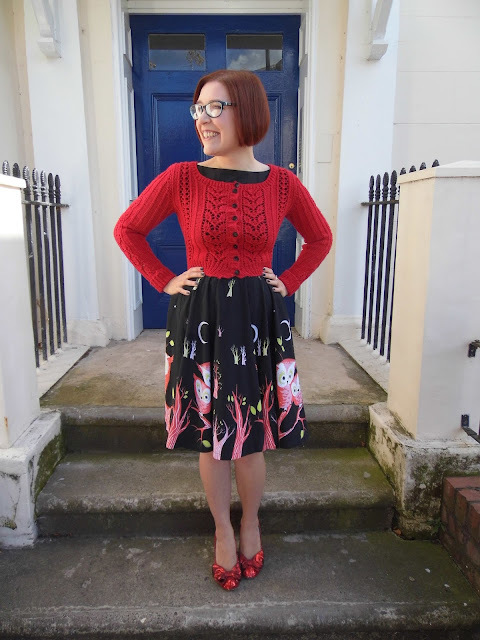 It's about knitting! While I was knitting my Audrey in Unst cardigans, I realised that I had been incorrectly knitting into stitches that had been formed with a yarn over, and that this was why the holes in my lace stitches didn't look as good as I would like. It was a bit of a lightbulb moment, and also a moment of feeling profoundly daft - but then, this is one of the downsides of teaching yourself. 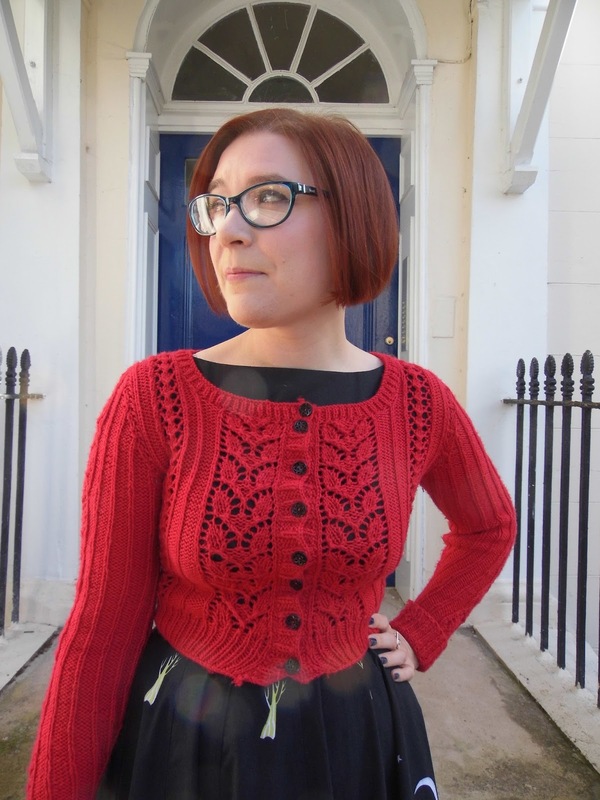 Anyway, armed with this knowledge, I decided to have another go at knitting Andi Satterlund's Agatha cardigan. I was inspired by my friend Lauren, who is currently knitting a Chuck sweater in a lovely deep red yarn - Cascade 220 superwash in 'really red' - which is a great, blueish red shade. I think choosing the smaller size was a good idea for me personally, as I like my cardigans to hit my natural waist and to be pretty fitted. So I'm very happy with the fit of this cardigan, although I wish I had used a slightly stretchier cast-off for the waist ribbing than I did. I chose not to, because I wasn't sure I'd like how it looked, but then I did use a stretchy method for the cuffs and it looks fine. 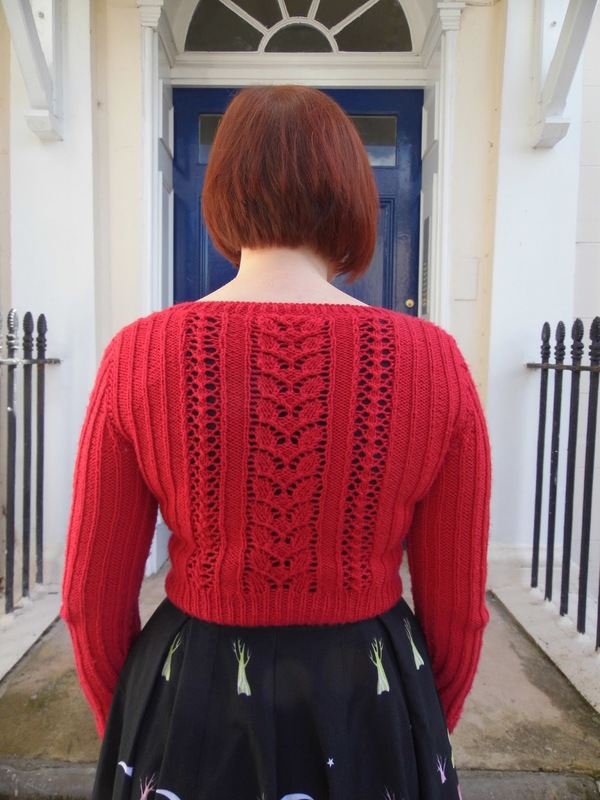 Ah well, live and learn, and this certainly won't be the last Agatha cardigan I knit. I'm very happy with the fit through the back, although part of me wishes I had knit the last central repeat fully before moving onto the ribbing. I followed the pattern, and maybe if I had knitted a few rows more I'd be crabbing that I should have knitted it a few rows shorter! This is the thing I am finding with knitting - it is a lot of trial and error. And here's how it looks unbuttoned! I have worn this cardigan a fair bit since I finished it - it's been nice, actually, because this brief indian summer we have been enjoying has meant that a thicker cardigan is the perfect layer without a coat. These photos were taken on Thursday, when I was working from home and going out for lunch with some friends. The dress is a shop-bought - or rather, ebay-bought dress from a number of years ago. 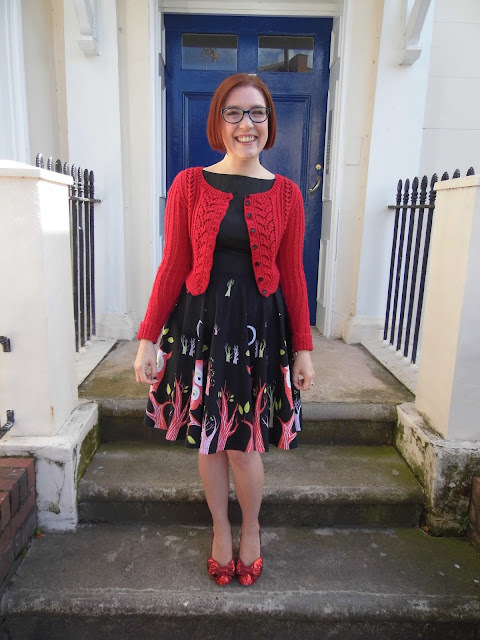 I try not to feel guilty when I buy dresses in shops or even when I wear the small number of shop-bought dresses that I still have in my wardrobe, and the guilt is definitely assuaged when I am able to wear them with hand-knit cardigans! I still feel that I have a long way to go with knitting, and that I really am learning something new with each project. That's satisfying and exciting and it means that I can take a lot of joy out of completing something even when it is far from perfect. You can't say fairer than that, really. I have cast on my next project, which is a navy Hetty cardigan. My thinking there is that my newly improved lace knitting skills will work well with the all-over lace pattern on Hetty. So watch this space for that! Anyway, time to dander on here and do Sunday night up in style with another gin and tonic and maybe something slightly more edifying on the TV than that Kennedys thing. Goodnight!